Katja is playing her Day1A today. She got some sleep after that horrible travel yesterday and felt fresh. We took the PokerStars transportation bus this morning which brought us over to the Rio’s. The place was like crazy, FULL of people. I heard from a reliable source that already over 8500 players are registered – the fact that they took 200 alternates for the day confirmed that and would mean a 8800 cap. Unbelievable. Anyway, I accompanied her to the assigned table but had to leave as all spectators got thrown out of the amazon ballroom. The first update I got from her after level 1 (two hour levels) when she called me. She had 14000 in chips (10000 start chips), quite good. I was in a lunch meeting with a executive director from PokerStars at that time, further specifying my duties as the new german PokerStars blogger. After that meeting I went back to the room when Katja texted me a message that she had 24000 in chips now, more than doubled up! Great news! When it was time for the dinner break I went over to the Rio’s, picked her up and we took dinner with Wilie Tan, John Duthie and one other european guy. Katja still had 21000 chips left and was in good shape. I am back in the room now and wait for updates from Katja, she has played three levels so far and has three more to go. 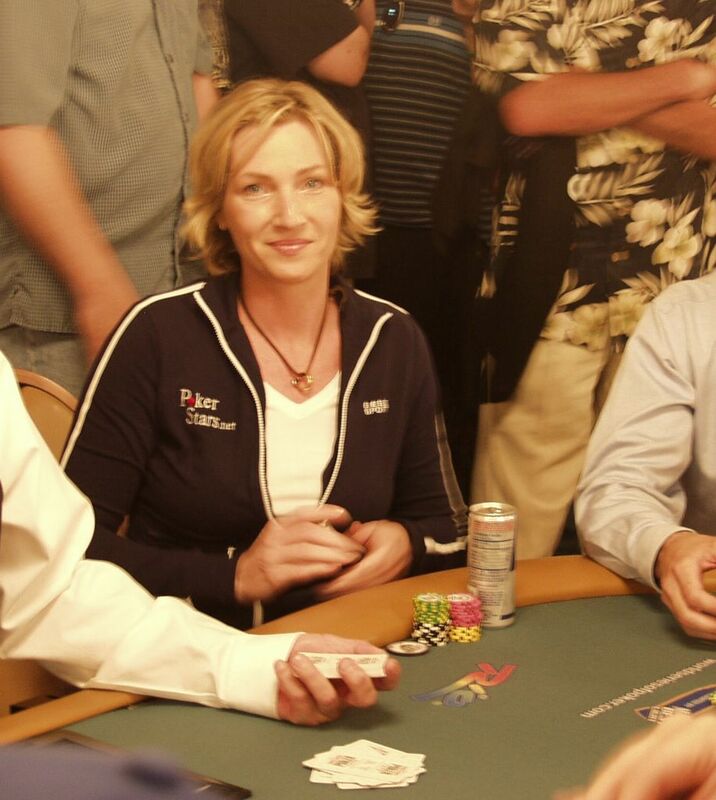 Regular reader Wolverine Fan was so kind to point out that Dr. Pauly from Tao of poker has posted a picture of Katja in his last post. Just went over an picked Katja up – she has survived Day1A! Her chip count is 24500 which is just below average. Great accomplishment! Considering the short and bad sleep she had and the long hours (from 12 noon until 4 AM, 12 hours playtime, six two-hour levels) played this is really a great success in itself. I dont know any specifics other than the had to lay down KK once on a 24000 pot and doubled up again with KK. She said she almost played no other hands. Now Katja has three days off to recover and prepare herself for Day2A !! !